Tournai (Doornik in Flemish, Turnacus in Latin ; pop. 68,000) is a quiet town tucked in the north-western corner of Wallonia at the border of France and Flanders. The town is renowned for its cathedral and belfry, both designated UNESCO World Heritage sites. 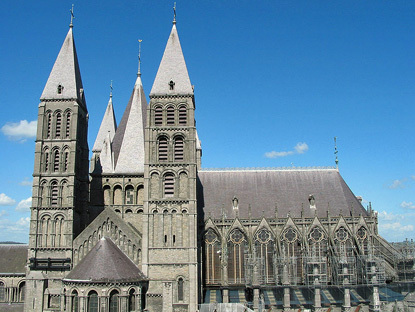 Tournai was founded by the Romans around 50 CE, making it the oldest town in Belgium long with Tongeren. 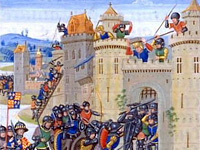 It became a royal city of the Kingdom of France under Merovingian kings Childeric and Clovis, and was still French during the Hundred Years War. 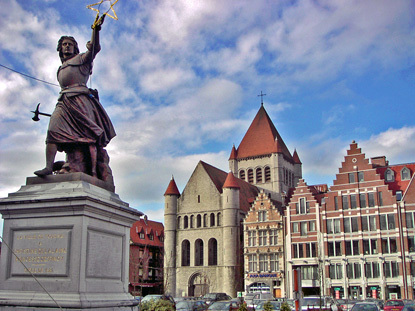 Tournai briefly became an English possession under Henry VIII (the only town in Belgium to have ever belonged to England), before joining the Spanish Netherlands. It flourished in the late Middle Ages as a centre for tapestry, embroidery and goldsmith's works, and gave birth to several major Renaissance architects and painters. The town's most interesting edifice are the 800 years old Our Ladys' Cathedral (Cathedral Notre-Dame in French) and its its five towers. The nave and the transept, in Romanesque style, were built in the 12th Century, while the choir, in Gothic style, was built in the 13th century. Dont' miss "The deliverance of souls from the Purgatory" by Pierre-Paul Rubens in the St Louis Chapel. The Treasury has reliquary chests and shrines from the 13th century. The cathedral is open from 9.30am to noon and 2pm to 5.30pm from April to October, and 10am to noon and 2pm to 4pm the rest of the year. Admission is free. The Treasury is open at the same time, but opens 15min later and closes 15min earlier. Admission is 1€ for individuals or 3€ for families or school groups. The 72m high belfry of Tournai was erected in 1188 and is the oldest in Belgium and in Northern Europe. You can climb the 256 steps to the top using the spiral stairs. It is open from 10am to 1pm and 2pm to 6.30pm from March to October, and 10 am to noon and 2 pm to 5 pm the rest of the year. It is closed on Mondays, Sunday mornings, on 15 August, 25 December and 31 December to 3 January. Some 12th century Romanesque stone houses have survived rue Barre Saint-Brice and are among the oldest burghers houses remaining in Western Europe. The Town Hall was built on the 11th-century Benedictine abbey of Saint-Martin in the early 19th century. The 13th c. Romanesque crypt and part of the 14th c. Gothic cloister have survived. The 13th-century bridge flanked by two towers known as 'Pont des Trous' was part of the old city wall and one of the few such building still standing in the world. The Cloth Hall is a splendid Renaissance building from 1610-1612 that merchants used to sell cloth goods on the market square. It was restored in 1998. The Tower of Henry VIII Tudor was built during the few years the city joined England in the early 16th century. Although the castle once had 60 towers and 18 gates, only the Marvis Tower, the Great Tower and the Pont des Trous remain. The Great Tower is 27m in external diameter with walls 6.9m thick. 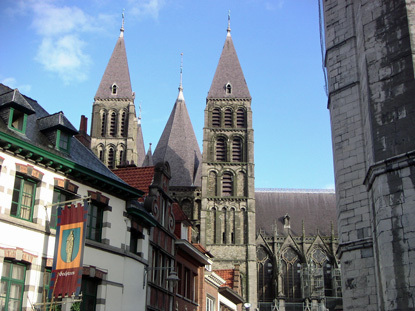 Tournai is only 30km away from Lille, and access is easy through the E429. Brussels is 90km in the opposite direction on the same motorway. Coming from Mons, take the E19 towards Valenciennes, the change to the E42 at St Ghislain. The E403 connects Bruges and Kortrijk to Tournai. 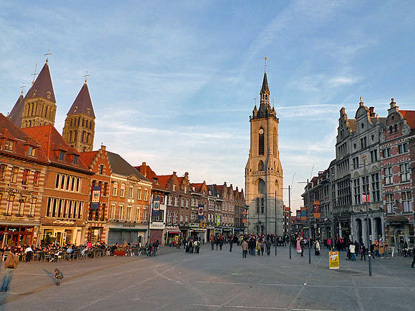 By train,Tournai is about one hour from Brussels or Ghent or Lille (France) and 25min from Mons.